Elio was born in Varese, Italy, on 5 August 1954 and grew up in Como. He studied art and received a Master of Arts before traveling to India to study Buddhism. On his return from India he moved to Switzerland, where for ten years he learned Tibetan language and Buddhist philosophy under one of the Dalai Lama’s philosophical advisors. Elio joined the Dzogchen community in 1986, when he received teachings from Chögyal Namkhai Norbu for the first time. Invited by the late Kalu Rinpoche, Elio spent almost twenty years in India working on the large encyclopedia on Indo-Tibetan knowledge known as Shes bya kun khyab (Myriad Worlds,Buddhist Ethics, Systems of Buddhist Tantra, The Elements of Tantric Practice) authored by Kongtrul the Great, published in separate volumes by Snow Lion Publications. During this time Elio continued to actively collaborate with the Dzogchen Community and especially with the Shang Shung Institute in Italy, of which he is a founding member. 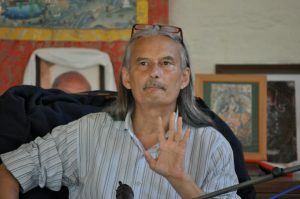 Elio has worked on various translations for the Shang Shung Institute in Italy, including several books by Chögyal Namkhai Norbu relating to Tibetan medicine. He has completed several levels of the Santi Maha Sangha training, and became an authorized teacher of the base, first, and second level. Since 2003, Elio has been one of the three principal translators for the Ka-ter project of the Shang Shung Institute of Austria. Aside from serving as instructor for the Training for Translators from Tibetan program, he also works for the Dzogchen Tantra Translation Project.